【PERFECT SIZE】4 feet in length, stretches to 5 1/2 feet, docking boats and PWC's up to 4000 pounds. Tensile strength is 2150 pounds. 【ADVANTAGE】Boats will easy run away or beat up against the dock when use the regular rope, because waves would bump them around until the rope came loose. But our our bungee dock lines have a lot of elastic and can bump around but stay attached. 【EASY TO INSTALL】Our dock line with the sleeve that you can easy to make a adjustable size loop to connect the cleat, wooden post and so on. There are 3 methods to attach your boat with the cleat or post in the listing image. Stretch Length: 5 1/2 feet. 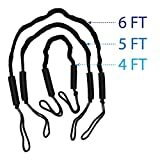 Loop Max size: 5.1 inch. Dock Line Material: Bungee cord inside. Docking Boat and PWC: Up to 4000 pounds. Two foam bumper in the end: Two floats prevent the lines from sinking in the event that they accidentally go overboard. Bungee dock line can absorbs shock to boats, cleats, docks, pylons and other hardware. Our dock line with the sleeve that you can easy to make a adjustable size loop to connect the cleat, wooden post and so on. There are 3 methods to attach your boat with the cleat or post in the listing image. Perfect bungee dock line, a must have for boat and PWC owner. Best idea for Kayak, SeaDoo, Yamaha WaveRunner, Kawasaki Jet Ski, pontoon, Honda Aquatrax, etc. How many of these do you need to secure a PWC to a dock? You will need at least two to secure the front and the rear of your PWC. This goes for almost all water craft as well. You need two points of restraint to prevent rotation when tying to a dock. Are these ideal for tying up to other boats when the water is rough or waves are rolling around? Yes, that's what our bungee dock line design for. If you use the regular rope to tie off your boats to the dock, your boat may easy to run-away because the waves would bump them around until the rope came loose. But our bungee dock lines have a lot of elasticity and can bump around but stay attached to keep your boat secure on water. ADVENTURE TRAVEL READY - pack a jacket, helmet, boots, and all your must have gear in this bag for your next outdoor adventure. The Athalon "Everything" Boot Bag is loaded with features to suit your active lifestyle. 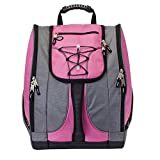 COMFORT FEATURES - this bag include padded hidden backpack straps, four padded lumbar back pads for comfort, and versatile top and front carry handles. The most comfortable, organized, and useful boot bag on the market, the Athalon Everything boot pack offers space for just about all your ski gear save your skis themselves. The bag--which includes four padded lumbar back pads for comfort and support--is outfitted with a large main compartment with separate side-entry zippered boot sections, making it easy to slip your boots inside after a long day on the slopes. You also have plenty of room for other items thanks to the large expandable pocket, which can hold a ski helmet or jacket, and the bungee cords on the front for maps, goggles, and other accessories. Perhaps the most convenient feature for frequent skiers, however, is the pair of hidden, reinforced backpack straps, which make it easy to carry the boot pack to and from the parking lot. Other features include a waterproof tarp along the bottom to keep the bag and its contents from getting wet; a vented boot section with bottom drainage grommets; clips in each pocket for gloves, keys, and other small items; a front MP3 player pocket with an exterior earphone port; top and front carrying handles; matte chrome hardware; and a contoured shape that fits your boots perfectly. Lined with reflective piping to improve visibility on poorly lit days, the boot pack carries Athalon's five-year warranty. Do You Ever Get Frustrated Carrying Your Boots Up the Hill When You Already Have So Much To Carry? 41" shoulder sling design sits comfortably at waist level so that you can carry boots easily over the shoulder. Effortlessly take your boots anywhere at your convenience. Wide loops on the sling to fit any boot. Easily feed the straps through the loops and lock down. Sturdy design secures boots in place to prevent falling into the snow so you always have dry and toasty boots. Lightweight tote design folds easily to conveniently put in your bag or pockets. Enjoy the slopes without worrying about extra weight. Tough quality stitching and strong nylon. This long lasting design will survive multiple seasons and prevent you overspending on costly replacements. 1.5 " sling width prevents the sling from digging into your shoulders. Order Now. Scroll to the Top of the Page and Press the "Add to Cart" Button to Order Now. [TRAILERABLE AND EASY TO USE] Perfect for both trailering and storage. Elastic cord in bottom hem gives a tight fit. Rear air vents allow inside moisture to escape. Free mesh storage bag included. Quick release buckles and strap system on the cover ensures easy fitting. 6 adjustable straps for Model A, 7 for Model B/C/D/E, 8 for Model F.
[CARE AND MAINTENANCE] Please do not allow the product to get in touch with sharp objects, chemicals, gasoline, or liquids. Spot clean with water, do not use detergent. Hang cover to dry and use storage bag to keep cover clean and stowed away when not in use. Be sure your boat is thoroughly dry before covering for long time storage. 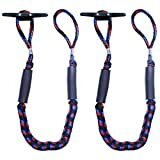 BUNGEE DOCKLINE ROPE - SGT KNOTS elastic dock line is perfect for quick and secure mooring of boats, jet skis, rafts, and other vessels to docks, cleats, and pylons. Our bungee dock rope is fast and easy to use, no fumbling over ropes or knots. VETERAN OWNED and OPERATED - Bungee Dockline Rope made in the USA. Just like the Marine Corps, SGT KNOTS is committed to being the best of the best. We continue to live by the motto, Semper Fidelis-Always Faithful. Our loyalty to our customers is what makes us who we are, and the reason we continue to grow in popularity and product offerings. We promise to maintain the strength and consistency of our products. We also pass down our bulk savings to our customers.